A crankshaft (i.e. a shaft with a crank) is used to convert reciprocating motion of the piston into rotatory motion or vice versa. 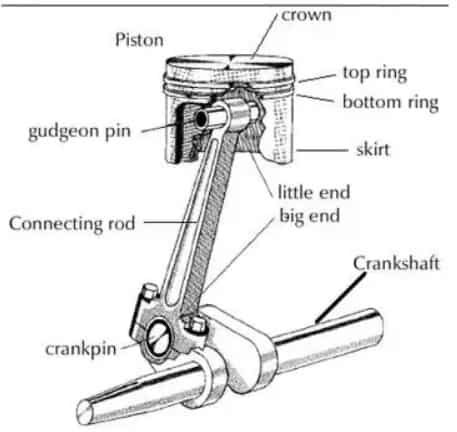 The crankshaft consists of the shaft parts which revolve in the main bearings, the crankpins to which the big ends of the connecting rod are connected, the crank arms or webs (also called cheeks) which connect the crankpins and the shaft parts. 2. Center crankshaft, as shown in Fig. (b). The crankshaft, depending upon the number of cranks in the shaft, may also be classified as single throw or multi-throw crankshafts. A crankshaft with only one side crank or center crank is called a single throw crankshaft whereas the crankshaft with two side cranks, one on each end or with two or more center cranks is known as multi-throw crankshaft. The side crankshafts are used for medium and large size horizontal engines. In industrial engines, the crankshafts are commonly made from carbon steel such as 40 C 8, 55 C 8 and 60 C 4. In transport engines, manganese steel such as 20 Mn 2, 27 Mn 2 and 37 Mn 2 are generally used for the making of crankshaft. In aero engines, nickel chromium steel such as 35 Ni 1 Cr 60 and 40 Ni 2 Cr 1 Mo 28 are extensively used for the crankshaft. The crankshafts are made by drop forging or casting process but the former method is more common. The surface of the crank pin is hardened by case carburizing, nitriding or induction hardening. The bearing pressures are very important in the design of crankshafts. The maximum permissible bearing pressure depends upon the maximum gas pressure, journal velocity, amount and method of lubrication and change of direction of bearing pressure. The following two types of stresses are induced in the crankshaft. 2. Shear stress due to torsional moment on the shaft. Most crankshaft failures are caused by a progressive fracture due to repeated bending or reversed torsional stresses. Thus the crankshaft is under fatigue loading and, therefore, its design should be based upon endurance limit. Since the failure of a crankshaft is likely to cause a serious engine destruction and neither all the forces nor all the stresses acting on the crankshaft can be determined accurately, therefore a high factor of safety from 3 to 4, based on the endurance limit, is used. The crankshaft must be designed or checked for at least two crank positions. Firstly, when the crankshaft is subjected to maximum bending moment and secondly when the crankshaft is subjected to maximum twisting moment or torque. The following procedure may be adopted for designing a crankshaft. 1. First of all, find the magnitude of the various loads on the crankshaft. 2. Determine the distances between the supports and their position with respect to the loads. 3. For the sake of simplicity and also for safety, the shaft is considered to be supported at the centres of the bearings and all the forces and reactions to be acting at these points. The distances between the supports depend on the length of the bearings, which in turn depend on the diameter of the shaft because of the allowable bearing pressures. 4. The thickness of the cheeks or webs is assumed to be from 0.4 ds to 0.6 ds, where ds is the diameter of the shaft. It may also be taken as 0.22D to 0.32 D, where D is the bore of cylinder in mm. 5. Now calculate the distances between the supports. 6. Assuming the allowable bending and shear stresses, determine the main dimensions of the crankshaft. When Crank is at Dead centre (Maximum Bending Moment). When Crank is at angle where Twisting Moment is maximum. Draw a Free Body Diagram of the Crankshaft with various horizontal and vertical forces. Calculate the piston force. (We know Maximum Piston pressure, It can be assumed according to the industry norms as 200 bar for Diesel & 180 bar for SI Engines). Piston force is Max. Piston pressure * Area of piston. Industry assumptions while calculation of forces in FBD. Find all the horizontal & vertical reactions. Crankpin is also subjected to shear stress due to twisting moment. Thus we can calculate bending moment at centre of crankpin and twisting moment on crank pin and the resultant moment. Calculate Bending Moment at the centre of Crank Pin(from FBD). Solve and find Diameter of Crank Pin. The crank web is designed for eccentric loading. There will be two stresses acting on the crank web, one is direct compressive stress and the other is bending stress due to piston gas load (Fp). Calculate the Bending Moment from FBD. Check if BM is positive or negative. If Negative the increase the crank pin diameter and solve again. If positive then your design is safe. The total bending moment at the flywheel location will be the resultant of horizontal bending moment due to gas load and belt pull and the vertical bending moment due to the flywheel weight. Then you can find the diameter by using the Moment equation. M=(MOI*Sigma-b). The twisting moment on the crankshaft will be maximum when the tangential force on the crank (FT) is maximum. The maximum value of tangential force lies when the crank is at angle 30º to 40º for constant pressure combustion engines (i.e. diesel engines). When the crank is at angle at which the twisting moment is maximum, the shaft is subjected to twisting moment from energy or force stored by flywheel. The above design parameters can be cross checked for the factor of safety while designing by considering the crankshaft at an angle of maximum twisting moment. If the factor of safety is more than 1 then the design is safe. Considering this, we have to various forces acting on crankshaft at different twisting angles. This is a basic design concept used in the industry for designing Crankshafts for various IC Engines, but there are various parameters & relations which are only known to the industry and is their copyright. Thus for studying you can refer to various design data handbooks available in the market for Machine design. 1. The crankshaft must be designed or checked for at least two crank positions. Firstly, when the crankshaft is subjected to maximum bending moment and secondly when the crankshaft is subjected to maximum twisting moment or torque. 2. The additional moment due to weight of flywheel, belt tension and other forces must be considered. 3. It is assumed that the effect of bending moment does not exceed two bearings between which a force is considered.